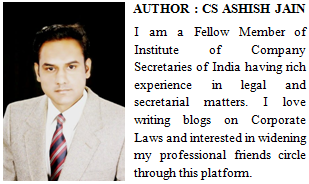 "RESOLVED THAT the Company do take on lease from M/s. __________, ........................... (brief description of machinery) along with accessories for the use of the Company on the terms and conditions set out in the draft Lease Agreement received from _________ a copy of which draft Lease Agreement duly signed by the Chairman for the purpose of identification has been placed on the table of the meeting." 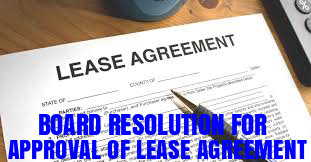 "RESOLVED FURTHER THAT the said draft of the Lease Agreement be and is hereby approved and the following Directors (1) Shri ................., (2) ........................., and (3) Shri ............................. be and are hereby severally authorised to accept on behalf of the company such modifications therein as may be suggested by or acceptable to _______." 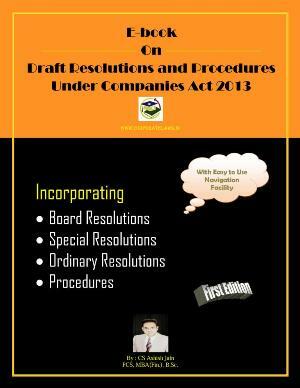 "RESOLVED FURTHER THAT the Common Seal, if any, of the Company be affixed to the fair stamped engrossment in duplicate of the Lease Agreement on the lines of the said draft (with such modifications as may be agreed to between _____ and on behalf of the Company) in the presence of any two of the following Directors, namely, Shri ............, Shri ............ and Shri .............. who shall sign the same, and Shri .............. who shall countersign the same. "RESOLVED FURTHER THAT after execution of the said Lease Agreement, Shri .............., be and is hereby severally authorized to do all such acts, deeds, matter and things as may be proper, necessary and expedient for giving effect to this resolution.